Bernard Miles sits uneasily among the knights and lords of his profession, in that he was notably down-to-earth, identified neither with the classical theatrical repertoire nor with grandiose directorial projects; he was honoured primarily for building, and then running, the new Mermaid Theatre, which opened in Blackfriars in 1959. The success of this venture owed much to goodwill earned by the quirkily likeable persona he had created over the years across a wide range of media, cinema included. 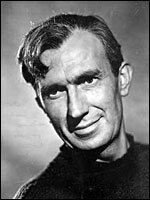 Two highlights in a long career of character roles are in David Lean films: his Petty Officer Hardy in In Which We Serve (1942) and his definitive Joe Gargery in Great Expectations (1946). To both, he brings a direct sincerity, a rich regional diction, and the ability to convey pain beneath a stoical exterior. Though few of his roles have the same depth, these qualities were repeatedly and aptly used both by Michael Powell (e.g. One of Our Aircraft is Missing , 1942) and by the Boulting Brothers , for instance in the key 1940 short Dawn Guard , where he articulates the vision of a better postwar world, and later in Fame is the Spur (1947) and The Guinea Pig (1948, which he co-wrote). His heavy in the remake of The Man Who Knew Too Much (US, d. Alfred Hitchcock, 1956) was an effective casting against type. Miles's two films as director are attractive fables of social harmony, the rural comedy Tawny Pipit (1944), and the factory-set Chance of a Lifetime (1950), which earned brief notoriety for its challenge to the conservative booking policies of the main circuits. It was typical of his modesty to give joint credit to his editors, Charles Saunders and Alan Osbiston respectively. He was married to actress Josephine Wilson .